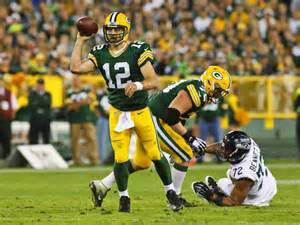 Here are some of the numbers that helped define the Packers 38-10 win over the Seattle Seahawks on December 11. The Packers have now won four of their last five against NFC West opponents. They are 16-7 against the NFC West during the Mike McCarthy era and 9-2 at home against that division since 2006. The temperature at game time was 26 degrees. Since 2000 they are 27-10-1 in games when the temperature is under 30 degrees at game time and 25-5-1 at home in those games. Davante Adams scored on a 66-yard TD pass from Aaron Rodgers in the first quarter. It was the first TD pass of 60+ yards in his career. It was the longest TD play for the Pack since 11/9/2014 when Rodgers hit Jordy Nelson with a 73-yard TD pass in a game versus the Bears. Since 2000 the Packers have scored 25 TDs of 60 or more yards; Jordy Nelson has been on the receiving end of 10 of those scoring plays. Rodgers had three TD passes in the game and now has 32 for the season. It is his sixth season with 30+ TD passes tying him with Tom Brady for fourth place on the all-time list of most 30+ TD pass seasons in the league. Drew Brees, Brett Favre and Peyton Manning are tied for first with nine seasons with 30 or more TD passes. Mason Crosby missed a field in yesterday’s game, although it did not factor in the final decision. Green Bay is 10-4 since 2014 in games when he misses a field goal attempt. Crosby had eight points in the game (one field goal and five extra points). The Pack is 65-16-1 in games when Crosby tallies eight or more points in a contest. Green Bay scored first in the game and has now won six straight at home when they score first. Damarious Randall had two of the team’s five interceptions. The Packers are 23-3 in the last 26 times when a player has two or more picks in a game for the team. The team has now won 21 straight when they have four or more interceptions in a game. In the 39 games in history where the team had five or more interceptions, the team is 36-3 with two of those losses coming in 1953 and one in 1955. Green Bay had a 21-3 lead at halftime. They have now won 52 straight at home when they have a lead of 14 points or more at halftime; the last loss was to the Lions in 1983. Adams had another 100-yard receiving game. Of the last nine 100-yard games by a receiver for the Packers, Adams has had four of them. Rodgers QBR for the game was 150.8, his fourth career game with a QBR over 150. The Packers are 17-0 when Rodgers has a QBR of 135 and above, and they are 30-2 when his QBR in a game is 120 or above. Jordy Nelson had his 12th career game with multiple TD receptions. He is tied with Sterling Sharpe with 12 games with 2+ TD receptions. Antonio Freeman tops this category for the team with 13 such games. The Packers allowed only 10 points in the game and have now won 13 straight when they allow 10 or fewer points in a game. They are 28-1 in games since 2006 when the opposition scores 10 or fewer points. They have now won 53 straight games at home when they hold the opposition to 10 or fewer points; the last loss was in 1991 when the Bears won 10-0 in a game on November 24.